Ian Hutchinson is Professor and Head of the Department of Nuclear Science and Engineering at MIT. His primary research interest is the magnetic confinement of plasmas: seeking to enable fusion reactions, the energy source of the stars, to be used for practical energy production.He and his MIT team designed, built and operate the Alcator C-Mod tokamak, an experiment whose plasmas, with temperatures reaching beyond 50 million degrees Celsius, are prototypical of a future fusion reactor. 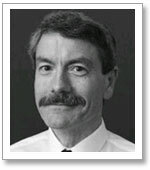 He is the author of the key text on plasma measurements: Principles of Plasma Diagnostics, now in its second edition. Dr. Hutchinson has written and spoken widely on the subject of science and Christianity, in academic, conference, and congregational contexts. He has been actively involved in Intervarsity Christian Fellowship, serving as Dean of the natural sciences track of "Following Christ," a national IVCF conference for faculty and graduate students. He is a fellow of the American Scientific Affiliation, the American Physical Society, the Institute of Physics, and founded "The Faith of Great Scientists" seminar at MIT. Web page - At the MIT website.